HomeNewsWorldCould Wreckage in Indian Ocean Be Malaysia Airlines Flight MH370? Could Wreckage in Indian Ocean Be Malaysia Airlines Flight MH370? The map shows the intended route of MH370 and the area that plane debris was found in on Wednesday. 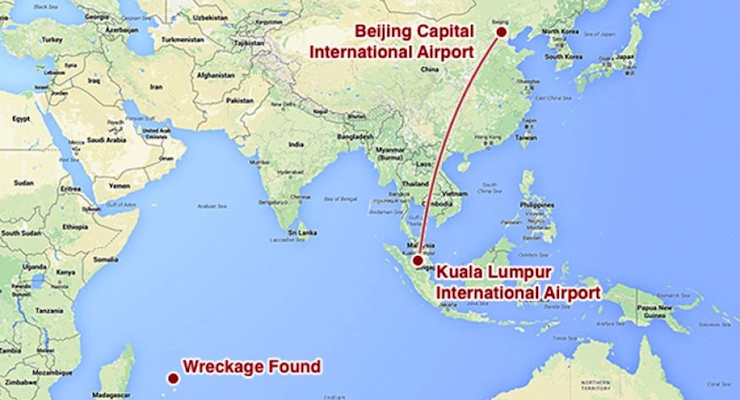 MH370 was less than an hour into its flight from Kuala Lumpur to Beijing when it disappeared from radar. Investigators believe it veered off course and went missing somewhere in the southern Indian Ocean. U.S. officials said Wednesday there is a “high degree of confidence” that the photo of aircraft debris washed up on a remote Indian Ocean island is from a Boeing 777. The wreckage, specifically believed to be a wing component unique to the Boeing 777, fueled speculation it could be from Malaysian Air Flight MH370, which vanished in March 2014. The official told The Associated that investigators — including a Boeing air safety investigator — had have identified the component as a “flaperon” from the trailing edge of a Boeing 777 wing. A French official also confirmed to AP that French law enforcement was on site to examine the piece found on the French island of Reunion, which is located in the western Indian Ocean. PPD could not confirm the report and The AP claimed U.S. and French officials spoke on condition because they aren’t authorized to speak publicly. Reunion, a volcanic French island with a population of nearly 850,000, is about 39 miles long and 28 miles wide. It is located about 500 miles east of Madagascar. The sheer number of barnacles collected on the plane debris indicates that it had been in the ocean for a significant period of time. The discovery was made by employees of a company responsible for cleaning the shoreline of the island, which is located near Madagascar, or thousands of miles west of the MH370 search area. But officially, the search area for Flight MH370 still covers some 75,000 square miles. MH370, which was carrying 227 passengers and 12 crew members, was due to fly from Kuala Lumpur, Malaysia, to Beijing on the morning of March 8 when it disappeared somewhere over the South China Sea. Officials believe it disappeared less than an hour after takeoff and investigators confirmed the plane flew south toward the southern Indian Ocean. A massive search effort that to date has cost more than $100 million and was fraught with bad weather and difficult oceanic conditions. Currently, the Australian Transport Safety Bureau is leading the effort. The cause of MH370’s disappearance is not yet understood, with some suspicion has fallen on the 53-year-old pilot of the plane. Malaysian government officials said that they definitely decided the pilot was the one who spoke the last words to air traffic control, “Good night, Malaysian three-seven-zero,” and that his voice by all measures was normal. It was initially thought to be the co-pilot who spoke the last words before the system was manually shutdown. After MH370 turned off its transponder, investigators found that the plane appeared to execute evasive maneuvers that experts have said could only have been accomplished if a skilled pilot was in control. Capt. Zaharie Ahmad Shah, who had extensive experience in the cockpit, also had a flight simulator in his home. Meanwhile, Shah was reported to be having relationship issues. 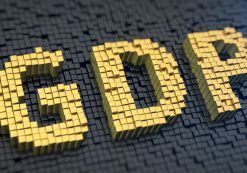 People's Pundit Daily delivers reader-funded data journalism covering the latest news in politics, polls, elections, business, the economy and markets. Did US State Department Encourage UK Trojan School to Defy Radical Muslim Teacher Ban?